The protection of a digital file from loss or degradation. Ensuring the information contained within the file remains accessible by the intended audience with the tools they might reasonably be expected to have available to them. This usually means migrating information from obsolete file formats to a current format. Records Management and Archives have traditionally managed the physical artefacts in their collections, and more recently digital facsimiles have been used to provide easier and wider access to their collections. The physical items remain available to be copied again, should the digital facsimile become corrupt. As technology has improved, early digital facsimiles have been replaced with higher resolution files that sometimes reveal more detailed information than the original itself e.g. faint markings, pencil notations, etc. This means that occasionally if the original artefacts are too damaged or are too costly to store, then the high res digital file becomes the Archival Master. Physical objects can be stored in environmentally controlled rooms and are subject to regular stocktakes, condition assessment, conservation and preservation treatments to ensure they remain accessible. And while the physical objects may degrade, the underlying technology of a Digital Archival Master does change radically. Therefore, a Digital Preservation condition assessment and regular checksums are an important Records Management activity to ensure the information in those digital files remain readable. In recent decades, more and more content has been generated digitally whether it is in the form of documents, emails, spreadsheets, databases or other file types. This Digitally Born content may never be reproduced in a physical form, however the need to preserve these files as records for an organisation remains the same as for the physical objects. Digital files can be subject to degradation through loss or corruption (bit rot), so the digital files need to be stored in a secure environment where they can be counted and assessed, and where digital conservation and preservation processes can be applied where necessary. A major concern with digital files is that the technological obsolescence of digital data is higher than other fields. A book that is centuries old is essentially the same as one produced today, while for digital files there is an intricate labyrinth of devices and formats, all of them incompatible one with another. In addition, digital platforms change and the long chains of interdependence on which they depend are complicated and fluid. For example, spreadsheets have evolved, and many early file formats can no longer be read by the latest spreadsheet programmes. If you have a large collection of digitised and digital born files we recommend you implement a Digital Preservation solution into your Records and Archives Management. 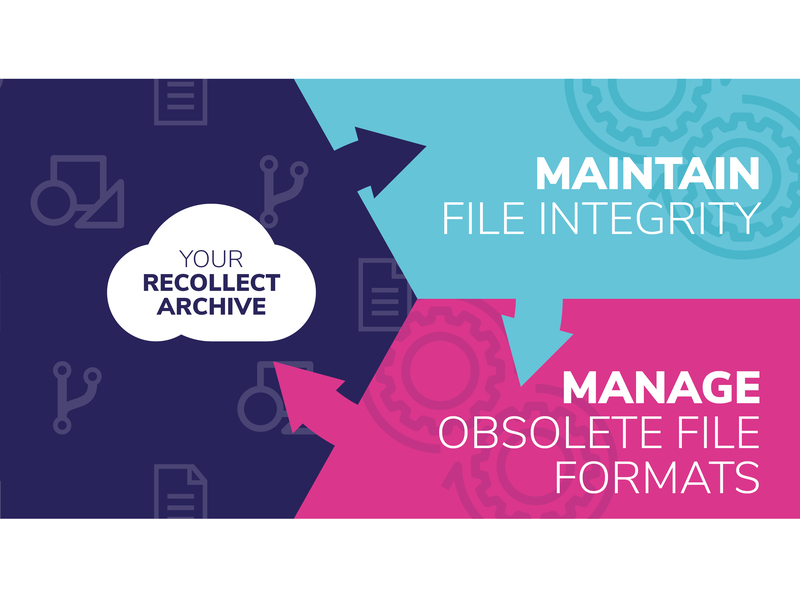 Discover how the Digital Preservation functionality in Recollect ensures your digital content is protected and preserved well into the future. More information about digital preservation can be found at the Open Preservation Foundation or the information reference data model developed by the Open Archival Information Standards Initiative. The Open Archival Information System initiative has developed a reference model which can be viewed at the OCLC website (https://www.oclc.org/research/publications/library/2000/lavoie-oais.html).